Concept: These are open woodlands ecosystems usually with tree coverage less than 30%. 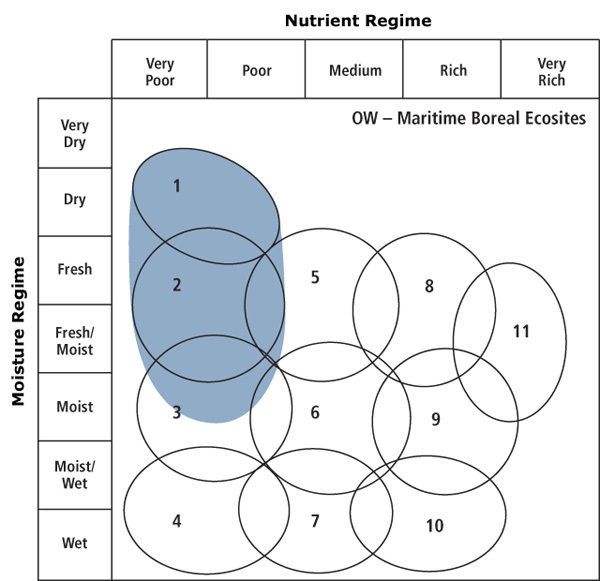 They occur on a variety of sites where growth and density are limited by low fertility, lack of moisture, thin soils and/or exposed bedrock. Stunted tree growth, a well developed shrub layer, and at times extensive coverage of reindeer lichens (Cladina spp.) are typical for this group. All Vegetation Types (VT) in this group are found in the Acadian Ecosite group, with some also found in the Maritime Boreal Ecosite group. Vegetation: Pine, black spruce, red maple and red oak are common trees associated with this group. Huckleberry, lambkill, rhodora, blueberry and wild raisin often dominate the shrub layer. Dwarf heaths are also common including broom crowberry and black crowberry. The herb layer is often poorly developed but can include bracken, cow-wheat, rice grass and poverty grass. Common lichens include grey reindeer lichen, green reindeer lichen and star-tipped reindeer lichen. Environmental Setting/Site Conditions: Vegetation types in this group are found on bedrock outcrops, shallow glacial tills, colluvium and sandy outwash plains. 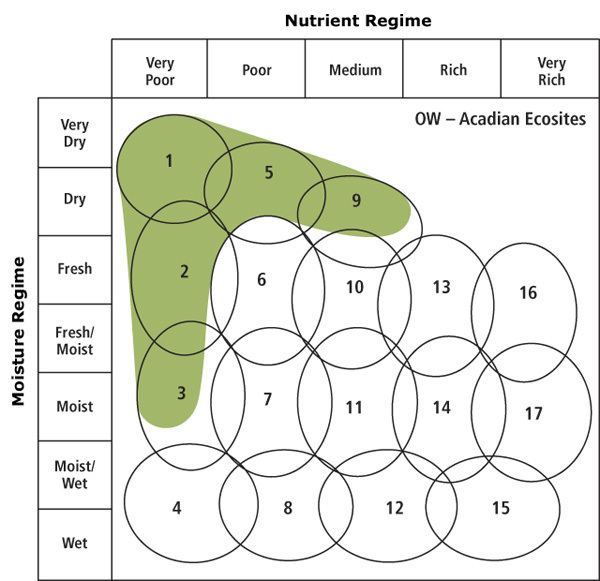 Soils are usually dry and nutrient poor, but some sites fall outside of these norms. Vegetation types form small patches on the landscape. This group is found throughout mainland Nova Scotia and is scattered in Cape Breton. Successional Dynamics: Open woodlands are mainly edaphic climax associations limited by low moisture, exposure and nutrient poor soils. Windthrow and fire are the main natural disturbance agents. Stands within a given VT may display a range of development stages depending on disturbance history and natural senescence. Ecological Features: Woodlands generally occur in conditions which are too harsh to support full canopy forests and their associated species. These small patch ecosystems are usually found on sharp crests and ridges, cliffs, rocky outcrops and slopes and/or sand flats. Sites often have thin, droughty, very stony or sandy soils and may have high bedrock exposure. Stands are typically stunted and/or open featuring species tolerant of low moisture, reduced soil accumulation and climatic extremes. High reindeer lichen cover is a characteristic feature, except on talus (units OW3 and OW6), taking decades to dominate ground cover. Habitat values vary considerably among units. For example, talus forests can support several uncommon small mammal and land snail species. Boreal and subarctic plants are associated with cooler woodlands, while inland and some types of coastal woodlands may support upland Atlantic Coastal plain species. Most of this group are unlikely to support old growth, however they may exhibit long term ecological continuity.